Magician David Blaine, who in the past has endured being entombed in a block of ice for 61 hours and being buried below ground for a week, ended his latest stunt on Wednesday night by leaping off the 80-foot high pillar he had been standing atop for nearly 35 hours. 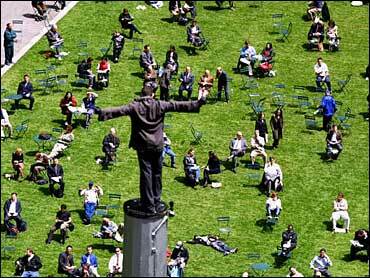 Thousands of fans gathered in a park behind the main branch of the New York Public Library on Fifth Avenue to see Blaine jump from the pillar, which at its peak had a width of about 22 inches, onto a 12-foot high pile of cardboard boxes. The final hour of the magician's latest stunt was shown live on an ABC television special called "David Blaine's Vertigo." After a 10-second countdown from the crowd, Blaine, dressed in baggy pants and a hooded sweatshirt, stepped from the pillar and landed flat on his back on the boxes. The magician and illusionist appeared physically wobbly but coherent and said "God bless us all" to the crowd before being taken to an ambulance to be examined by medical technicians. Event organizers said Blaine was not harnessed to the column and the only concession made to safety was two handles which he clutched during gusts of wind. Blaine went without food and had minimal amounts of water during his stint on the pole, during which he gave interviews to media outlets via a cordless radio set he was wearing. Before ascending the pillar on Tuesday, Blaine was asked why his public spectacles have been sheer endurance tests rather than magical feats. He replied that a magic-themed stunt would be "the next thing" and added, "But endurance is also important to me because it represents something greater. ... It's a sign of trying to do your best to do something."